Cricket in Israel has been popular since the time of the British mandate, and is keenly played today among Israel's 80,000 Indian Jews who immigrated to development cities in Israel such as Lod, Ramle, Ashdod and Beersheva, bringing with them their love for the gentleman's sport. Israel 21C reports that although a number of Israeli teams head to European competitions every year, the Israel Cricket Association, which organizes them, is yet to see an Arab or Bedouin member of Israeli society join the sport. A new immigrant to Israel plans to change the way cricket is played in Israel, and hopes to bring all members of the country on board while using it as a vehicle for reconciliation. Unlike soccer, football or rugby, cricket is a competitive but non-combative sport. It requires reflection, patience and skill, and gives players an opportunity to relate to each other as they wait up to 15 minutes of time for play. The idea to connect Israeli Bedouin kids to their Jewish neighbors through cricket came from within, and was catalyzed by a UK group Cricket4Change. A teacher from the Bedouin town Hura, in the Negev Desert had contacted the cricket development officer in Israel. The teacher said that he was keen to teach cricket to his kids at school. The Hura teacher was given a cricket set, pamphlets, a booklet and coaching course on how cricket is played. The children fit into two groups - from 9 to 12, and from 15 to 18. About 60 have been involved until now he says. There are additional effects built into the idea: Many of the older kids from the Bedouin population are problematic kids, who've been in jail before. Organizers believe their involvement is an opportunity to help them reform, as they learn to be coaches and mentors to the younger kids. It has been strange not to have written the blog with the frequency that I did in the past. However, with the heart attack behind me, I do now feel ready to start again. One of the objectives of this blog was to bring to the wider world, news from Haifa where possible. In restarting, a wonderful story has emerged how the city council has reacted to the potential lack of education in the children of the city in any emergancy situation. When the Haifa Mayor asked his wife if they would have sent their daughter to school during the Second Lebanon War, she responded with a firm "no way." Since Hizbullah rockets from southern Lebanon pounded the country's north during the summer, when pupils were out of school, The Mayor's question was a hypothetical one, but one that gave him cause. "I realized, if we weren't going to send our 16-year-old to school during such a situation, how could I expect anyone else to?". "We would have had to close down all of the schools in the city, and it got me thinking - how could we ensure the continuation of schooling, even during emergency situations?" The Mayor raised $1 million in donations from Israel and abroad and this led to the creation of "Learning From Afar," the Haifa Municipality's latest education initiative, which will allow students to learn from home during times of crisis. The program, which is called a type of "e-learning," draws heavily on the Internet, where Haifa-area teachers have built up a virtual schoolhouse, complete with a wide of array of lessons, instruction and worksheets, homework and even games and extracurricular activities for their pupils. Pupils log on from their home computers, as teachers - who, would likely sit in a fortified area within the school during an emergency - administer the classes, teaching pupils interactively, and even monitoring attendance from their computer screens. The program's first test run was held last week. Some 450 students from 12 Haifa schools - elementary, middle and high schools from the secular, religious and Arab sectors - logged on and continued their studies on-line. "It's really just an exceptional program, which went off without a hitch last week," the Mayor said. "We're going to keep testing it in all of Haifa's 126 schools, and we plan to be 100 percent ready by the start of the school year next fall." The program is moving along smoothly it's been such a success, that teachers have asked to use the system for sick pupils,"
However, "Learning From Afar" requires that pupils have a computer and an Internet connection at home, and the city is trying to assure that. "We did a survey and found that among the 40,000 pupils in the Haifa Municipality's jurisdiction, only 339 did not have computers," he said. "For us, it makes sense to purchase those computers and make sure that everyone is up to speed, rather than look for other alternatives." Teachers are excited about the possibilities presented by the new program, in part because they helped design it, and were able to customize the instructional methods for their classes. 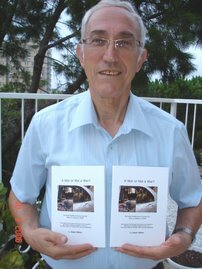 "The ability to include professional colleagues in the building of the system certainly improves the quality level of learning, and allows each pupil to express themselves individually, to take part in the lesson and succeed, which is amazing for an Internet-based program," said one Haifa high school teacher and recipient of the Rothschild Prize for teaching. "As a teacher, I see this as not only a tool to assist all pupils, but a way to help those same pupils who may have trouble expressing themselves in the classroom." My last blog was written on the day I came out of hospital following my heart attack, three weeks ago. Since then I have tried lead a calm, easy-going life style until I can get my fitness up to par again. I had taken short walks on the beach, eaten small meals regularly as advised by the doctors and swallowed pills, it seems, without end on a daily basis. There is a pill for this and a pill for that, not forgetting a pill for the other. All this plus another pill, all in the aid of science, that I don’t know whether it is a placebo or not, to provide a drug company with the data that will hopefully result in a pill for increasing the “good” cholesterol (HDL) in one's body. So having got used to the “new” regime, I arrived this week, Monday afternoon, going again into hospital to have one more stent inserted. Since, I am now familiar with the procedure; I entered the hospital with an “air” of confidence. I was received in the cardiology department like a long lost friend and acquaintances with the nursing staff renewed. And then, to get undressed and into hospital pyjamas that never seem designed to fit anyone and into bed for checking for this, that and the other. Patiently waiting my turn in the operating queue, I was then asked to go and wait by the entrance to the catheterization room. As the nurse said, “you can go there under your own steam but we will wheel you back in your bed”. Getting on to an operating bed which is designed to be so narrow that there is a danger of rolling off, one uses one’s arms rather like a tight rope walker to maintain one’s balance. When the staff was ready I was told to put my arms behind my head and relax. Now tell me, as a patient, how does one relax in an operating theatre? A local anesthetic was applied and during the 20 minutes of the “procedure” I was able to “enjoy” an interesting conversation with the surgeon, one Dr Machoul, yup, one of our wonderful Israeli Arab doctors, who was interested to improve his use of the English language. It all seemed to be over before the whole thing had started and a few minutes later was back in my room. The time now was 4:30 pm. At 5:45 am the next morning (of course one doesn’t go into hospital to sleep!!) a nurse arrived to remove the bandage and by 7:15 am, I was told to get up (slowly to avoid dizziness), get dressed and go home. Now that to my mind is efficiency. I will be continuing with my gentle walking on the promenade (boardwalk) at the beach until mid July when I am signed up for the heart rehabilitation department at the hospital and they will give me a personally designed fitness program to bring me back to normal, or is it average? I have written this detailed account because it seems to me that many consider a heart attack a cause to go into depression. As the surgeon said to my wife after the latest procedure when she commented on how good I was looking, “it is a matter of being optimistic and not pessimistic” – here endeth the lesson! !